than a state of mind." 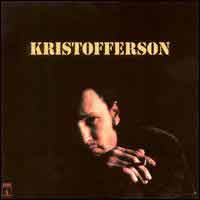 One of the original...country outlaws...Kris Kristofferson hit the scenes with his self-titled debut in 1970. The album went nowhere...until Janis Joplin covered..."Me And Bobby McGee". It was subsequently released again...a year later...and the rest is songwriter history. Admittedly, an acquired taste vocally...(I like it. )...his songwriting talents have never been questioned. In 2004, Kris was inducted into the Country Music Hall Of Fame. Lost Gem:--> "To Beat The Devil"...is an incredible shared memory of the struggle to survive on the road as an unknown troubadour. Hopelessly compelled to risk the pain from apathy's grin...for the all-too-brief moments of euphoric connection on stage...(and maybe a sandwich). Kris wears it well. "A couple of years back, I come across a great and wasted friend of mine in the hallway of a recording studio; and while he was reciting some poetry to me that he'd written, I saw that he was about a step away from dyin' and I couldn't help but wonder why. And the lines of this song occurred to me. I'm happy to say he's no longer wasted and he's got him a good woman. And I'd like to dedicate this to John and June, who helped show me how to beat the devil." And I was lookin' for a place to get myself out of the cold. To warm the frozen feelin' that was eatin' at my soul. But it'd been of month of paydays since I'd heard that eagle scream. I saw that there was just one old man sittin' at the bar. And in the mirror I could see him checkin' me and my guitar. An' he turned and said: "Come up here boy, and show us what you are." I said: "I'm dry." He bought me a beer. He nodded at my guitar and said: "It's a tough life, ain't it?" I just looked at him. He said: "You ain't makin' any money, are you?" I said: "You've been readin' my mail." He just smiled and said: "Let me see that guitar. "I've got something you oughta hear." "To the things that you are sayin', who do you think's gonna hear. "Are things they could be changin', who do you think's gonna care?" 'Cos the truth remains that no-one wants to know. 'Cos I don't believe that no one wants to know.